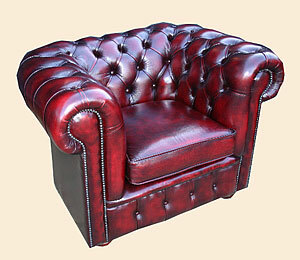 (cushion seat) Red leather shown. 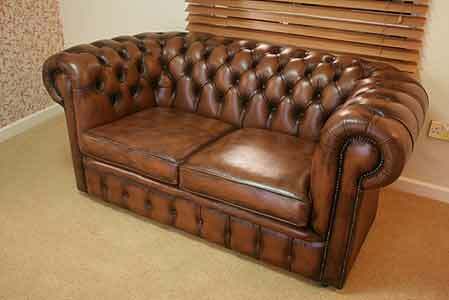 DC 065a Traditional Two Seat Chesterfield Sofa. 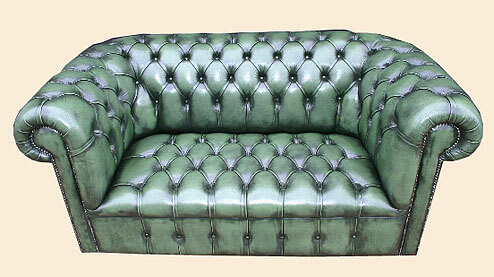 (buttoned seat option) Green leather shown. 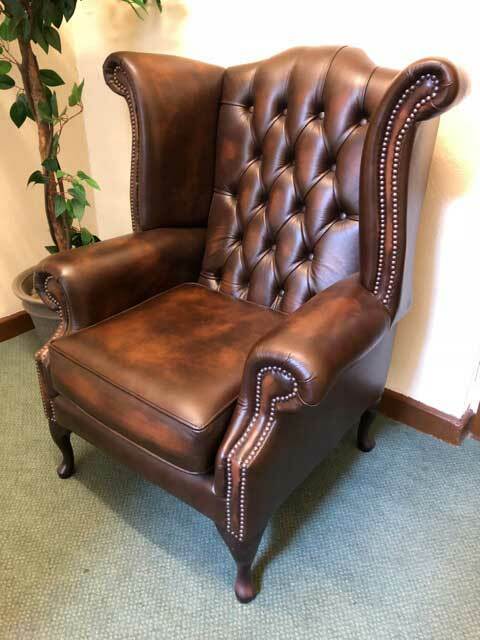 Chair frames made from solid hardwood, upholstered here in the UK by our own upholsters use old age traditional methods which take time and skill. 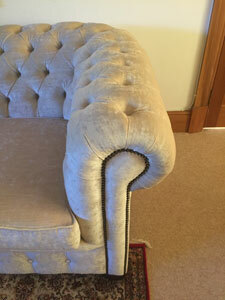 A choice of sprung cushion seats or deep buttoning. 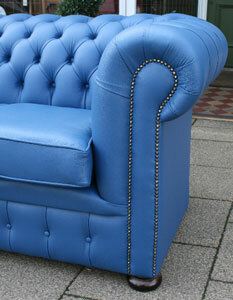 Other pastel leather colours available and material options. 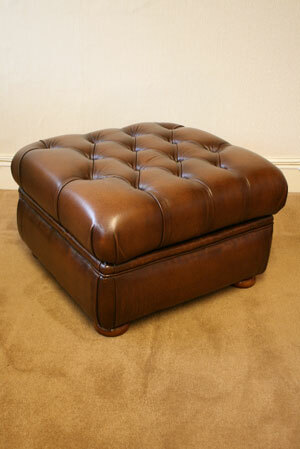 Wooden Chesterfield feet polished to match your furniture. 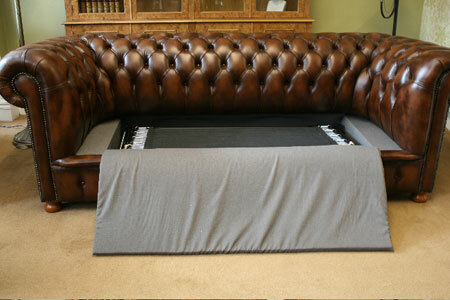 Made to measure option. 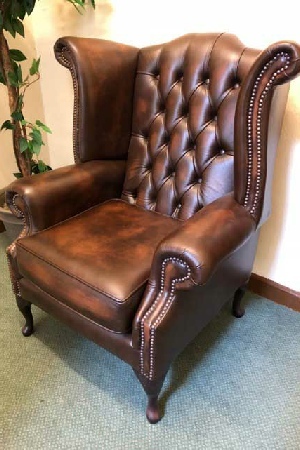 If you have a certain space to fit a sofa into, we can make the chair frame to the size you want and upholster in your choice of leather or fabric. Price on application. 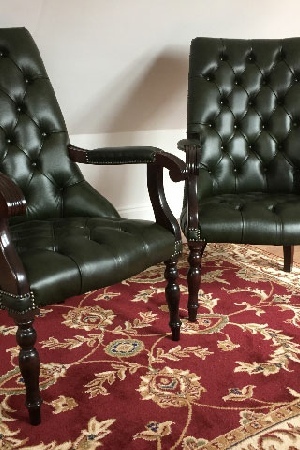 Choice of two styles Traditional & Victorian. Four popular sizes. Chesterfield chair, Two Seater, Three Seater and Four seater. 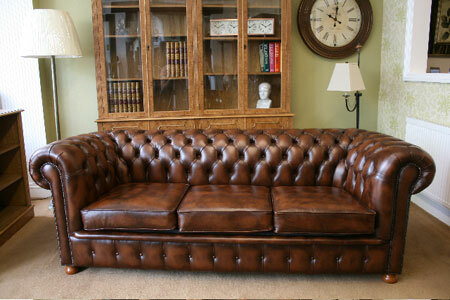 DC065a Traditional Two Seat Chesterfield Sofa (cushion seats) Tan leather shown. 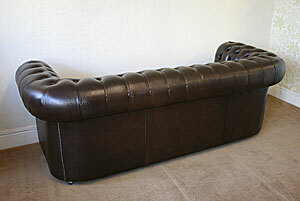 DC065a Traditional Two Seat Chesterfield Sofa (cushion seats) Wine leather shown. 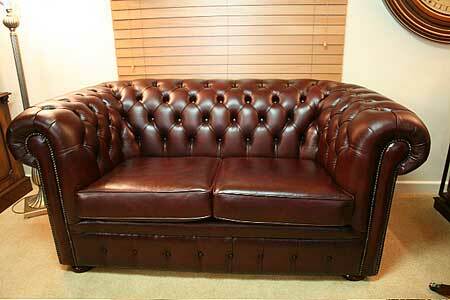 DC065b Traditional Three Seat Chesterfield Sofa (cushion seats) Brown leather shown. 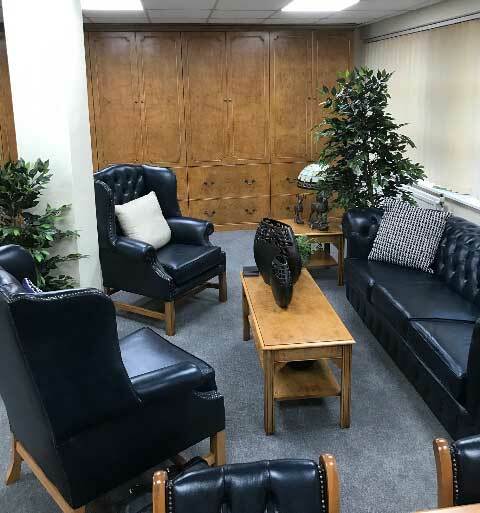 The offices of Nella Cutlery Services, Murrey House, Orpington, Kent. 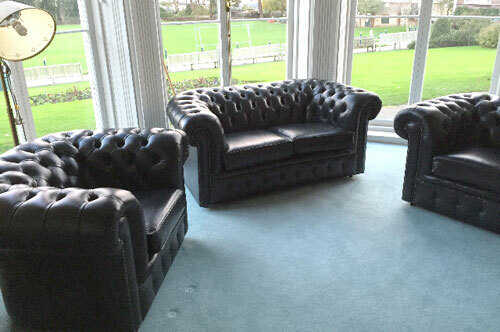 A range of Blue leather upholstered chairs, Three Seat Chesterfield, Georgian Wing Chairs and Boardroom chairs. 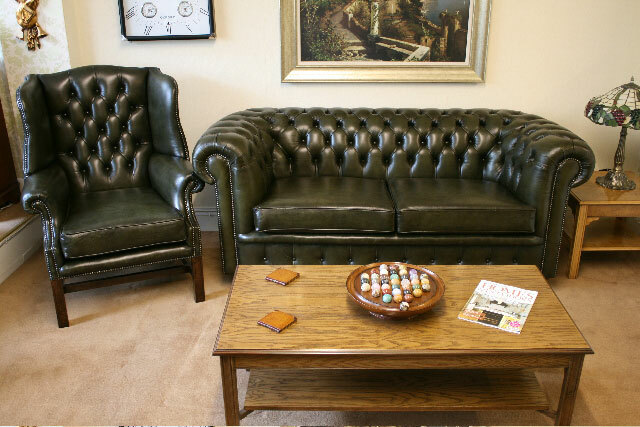 Burr Oak Coffee Table and Burr Oak Fitted Storage Units. 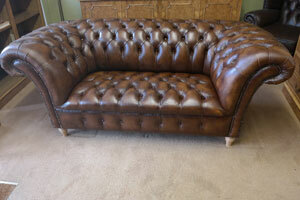 A DC065b Traditional Three Seater Chesterfield Sofa. 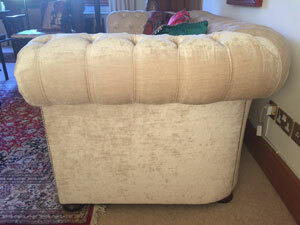 Upholstered in customers chosen Ross fabric, Pastiche Crush, Cream. RYDE SCHOOL Upper Chine. The Isle Of Wight. 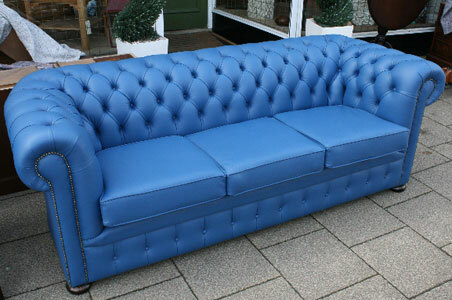 Dark Navy Blue, Traditional Chesterfield suite. A DC065c Four Seater Traditional Chesterfield Sofa and Georgian Wing Chair. 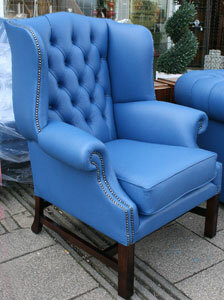 Very striking, customers chosen Pastel Blue leather upholstery. 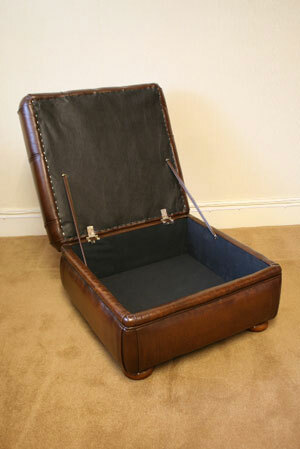 Pictures take prior to delivery. 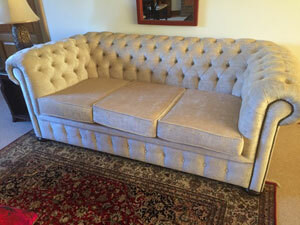 Two Chesterfield Sofa bed sizes available ( 3 seater and 4 seater ) giving either a 110 cm or a 140 cm wide mattress. 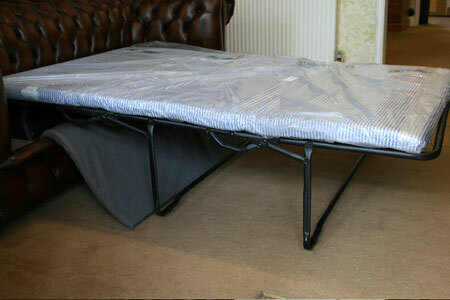 Pull out folding mattress and bed frame hidden within the sofa. 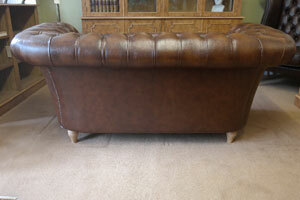 DC065bs 3 Seater Chesterfield Sofa Bed ( pull out mattress 110 cm wide ) Shown, Tan leather. 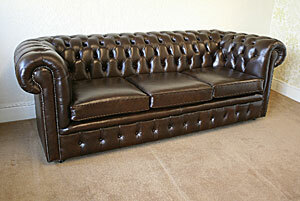 Traditional Range Chesterfield Sofa Beds. 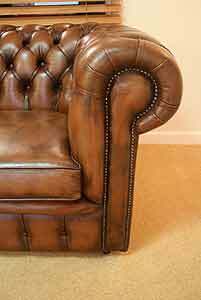 DC067b Victorian Style Two Seat Chesterfield Sofa ( buttoned seat option ) Tan leather shown. Note. 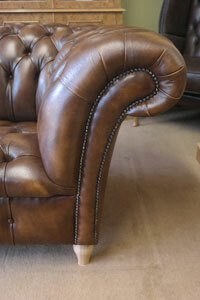 Turned wooden legs can be polished to any wood shade. 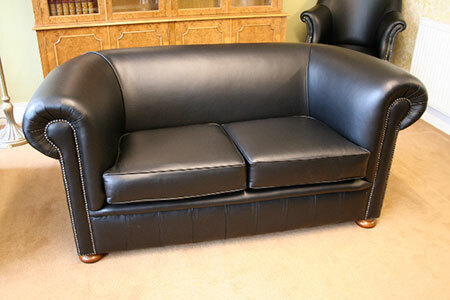 DC065a Traditional Two Seat Chesterfield Sofa ( plain upholstery option ) Black leather shown. 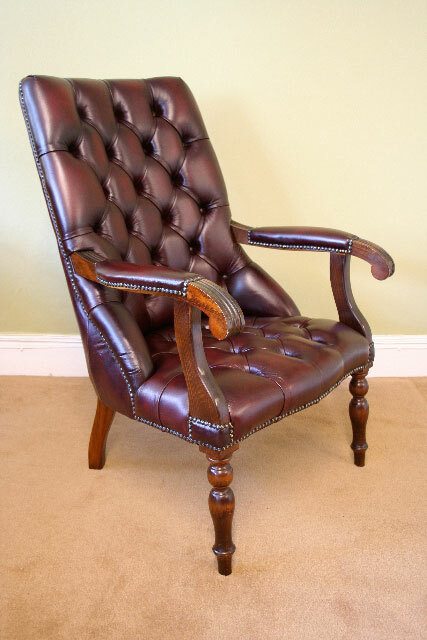 A Regency style, high back, open armed easy chair. 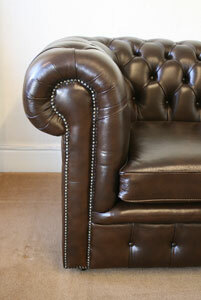 Shaped scrolled arms with leather padding. 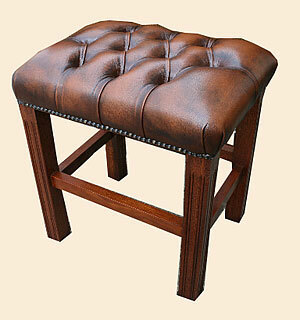 Turned front legs, choice of buttoned or plain upholstery and wood finish. 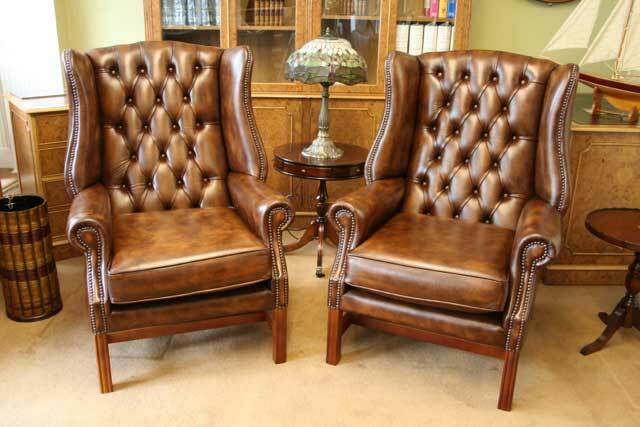 Examples shown in tan leather (left) and brown leather (right). 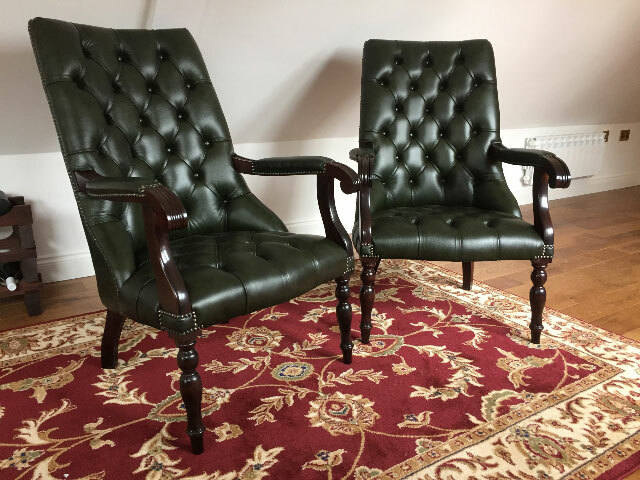 A pair of Georgian Style Wing Chairs. 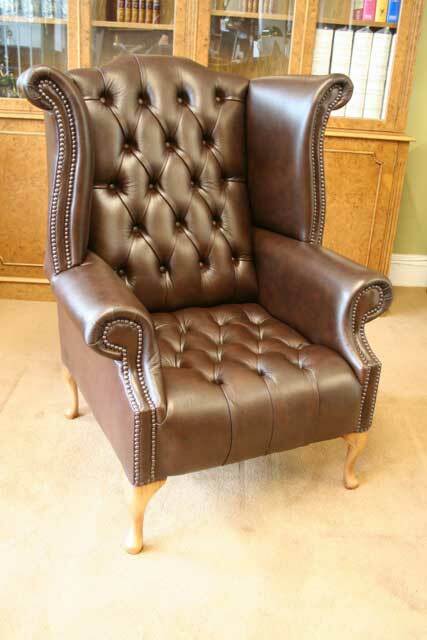 Tan leather, cushion seats, mahogany frames. 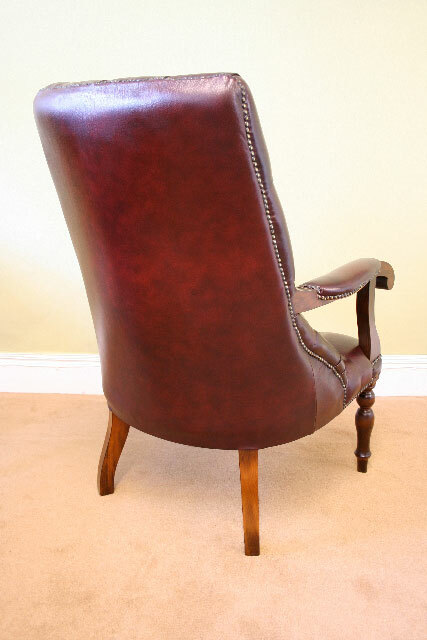 Shaped seat front. 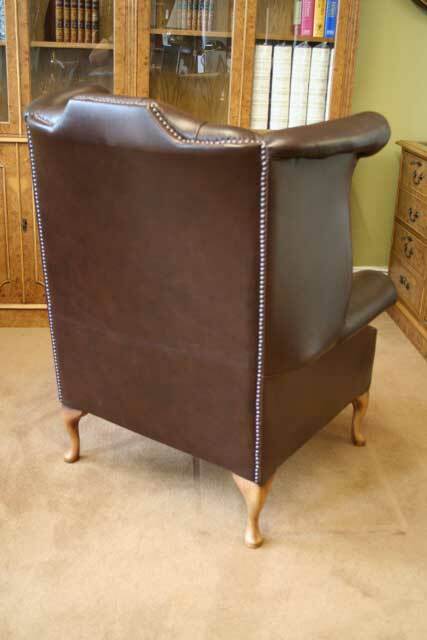 Button upholstered seat and back shown. 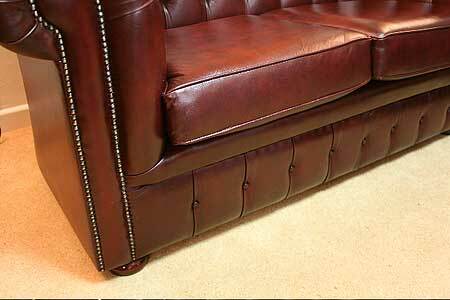 Tan leather.